As the spring semester begins to wind down, SFA's national "Boot the Braids" campaign is heating up! It's been quite an exciting start to the week as Notre Dame University, Georgetown University and Barry University take on the torch in the national rolling student fast, and two major Boot the Braids actions take off at Ohio State and Vanderbilt. We've got on-the-ground action reports from Columbus and Nashville, proving that sooner or later the leaders of this country's top universities will be forced to face student concerns over contractual ties with greedy corporations, like Wendy's, that turn a blind eye to farmworker exploitation in their supply chain. Just as the semester drew to a close in Columbus, scores of students with the OSU Student/Farmworker Alliance and Real Food OSU gathered on the university’s Oval for a march calling on President Michael Drake to keep his word and cut OSU’s contract with Wendy’s, unless and until Wendy’s joins the Fair Food Program. After nearly four years of campaigning for OSU to take a stand for fundamental human rights, 19 students and alumni fasted for 7 days last month during CIW's major action — a courageous act that sparked a national movement of rolling student fasts in the Wendy’s Boycott. As the rolling fast spread like wildfire to nearly a dozen universities across the country, all calling on President Drake to honor his promise and cut the contract with Wendy’s, students were told to expects a decision by the end of the semester. Yet, with the last day of classes behind them, and finals season coming to a close, the OSU Student/Farmworker Alliance has yet to receive a response from the administration. But the OSU students would not stand for silence. On Tuesday, students held a spirited march through the heart of campus with their message focused squarely on President Drake. 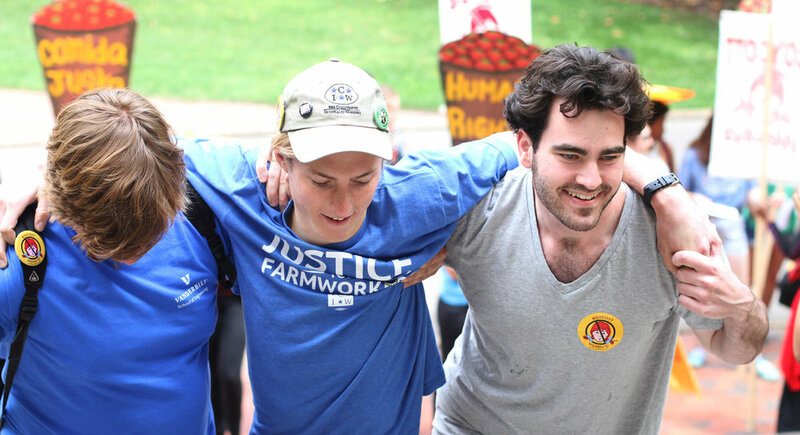 OSU has the power to stand with farmworkers on the right side of history, and create a beautiful example for universities nationwide … This movement is gaining power every day, and has the support of allies across the country. OSU students and community members did a 7 day fast for farmworker justice last month, which has turned into a rolling fast through many other schools, including University of Michigan, Vanderbilt, Georgetown University, Notre Dame, and New College of Florida— where the university’s president, Don O’Shea, fasted for a day in solidarity with the OSU Boot the Braids campaign. We will not compromise, we will not back down, we will not take no for an answer. All eyes are on you, President Drake: keep your word and cut the contract with Wendy’s! 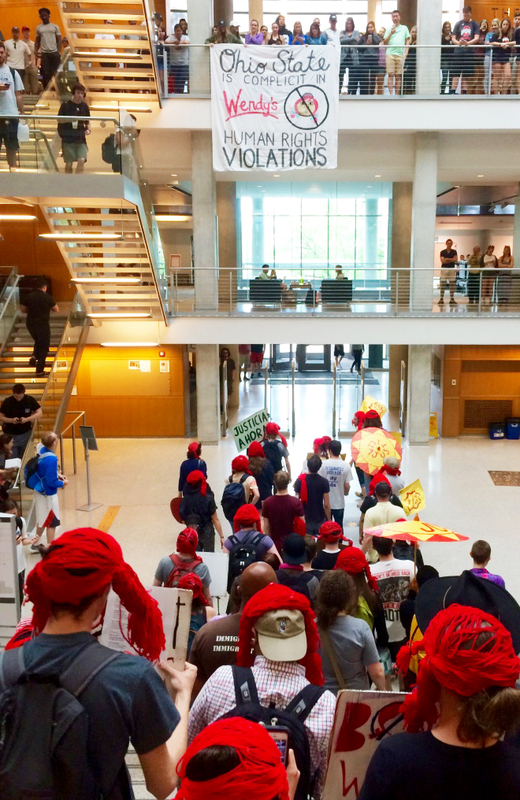 With that, the crowd marched into the library, breaking out in song, and inviting all those studying in the stacks to take a moment to learn about the crucial role OSU could play in the struggle for farmworkers’ human rights. As a banner dropped from the third floor reading “OSU is Complicit in Wendy’s Human Rights Violations,” hundreds of students gathered to hear Alex Hoey ’19 clearly lay out why OSU must ‘Boot the Braids’ before she and the other marchers were escorted from the building. As the group chanted “President Drake, where are you? Who are you accountable to?” the group ended their march by heading to the Ohio Union, once again drawing the attention of hundreds of students on the Oval and hundreds more inside the Union itself. And those hundreds of conversations were not without result. Even amidst the buzz and bustle of final projects, term papers and graduation preparations, Vanderbilt student leaders spent the days ahead of Tuesday’s actions gathering over 600 signatures for their petition to remove Wendy’s from VU’s Taste of Nashville Program (totaling in more than 1,300 signatures from VU students this year, on top of the 700 gathered last semester!). At noon, students kicked off the breaking of the fast with a lively picket at the Wendy’s on West End — the campus restaurant where students can use their Vanderbilt dining card to grab a burger or Frosty. In addition to dozens of students, the protest was further bolstered by members of Nashville Fair Food and Workers’ Dignity — and of course, CIW members from Immokalee! The picket soon turned into a march to the heart of campus, where student fasters had been camped out all week. And despite the deep physical toll exacted by seven days without food, the fasters’ spirits were stronger than ever — faster Cal Filkin even led the protest march in song! When they arrived at the fasting tent, they were greeted by over 50 awaiting students, many of whom had committed to fast for 24 hours in solidarity with the Boot the Braids campaign. From there, the march numbers continued to swell, as more and more students joined the trek to Chancellor Zeppos’s office and upon arrival, began to file into the building, with a little helping hand for those who had fasted for the week. Nearly 100 students packed the room once inside the administration building to deliver the 600 new petition signatures, along with dozens of letters of support from faculty and campus organizations, directly to the Chancellor. Vice Chancellor Kopstain thanked all those present for coming, and promised to pass the letters and petitions along to Chancellor Zeppos in order to continue the dialogue about the campaign. After the emotional fast-breaking ceremony, the group shared a meal together at the Rand Dining Center before sharing their own reflections on student/farmworker solidarity and the extraordinary excitement built on campus for the Wendy’s Boycott over the last week. Vanderbilt students and Nashville community are fired up and already making plans for the road ahead in bringing the Boot the Braids campaign to victory! Well, President Drake, live up to your values! Cut the contract with Wendy's to support worker-driven social responsibility and ensure that the tens of thousands of farmworkers who harvest the food served at OSU can do so with dignity. International labor rights expert James Brudney pens hard-hitting op/ed for OSU campus newspaper comparing Fair Food Program and Wendy’s corporate code of conduct!